Sunday March 31st 1878 It was rather a pleasant morning Hatt and I went to church stopping for Win. After service I was baptized into the church. I staid with Win till after dinner and she came home with me We found Mr [Whetstone?] Mr Payer and Kate Boyer here. We went to the bridge with them when they went home. After helping with the supper work I wrote a letter to Lizzie Lindley and sent her my picture. 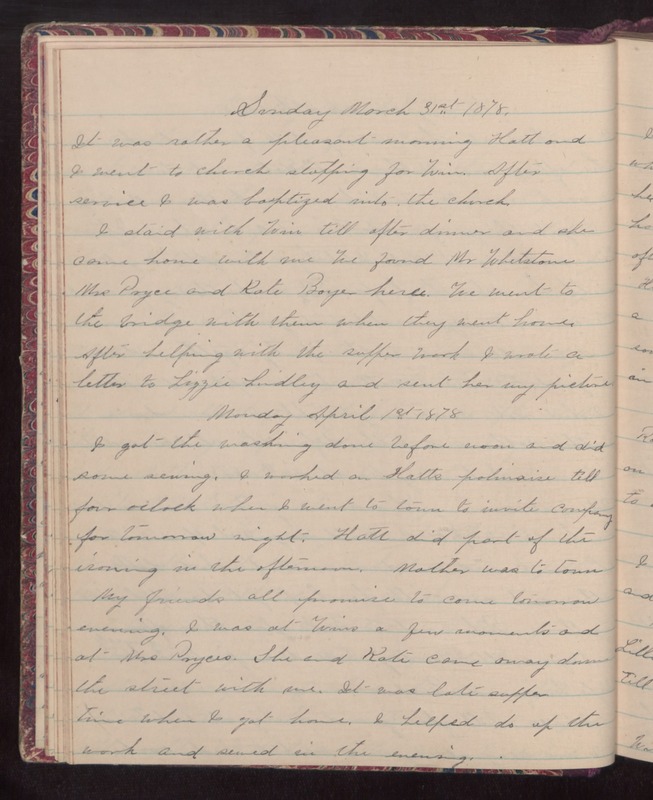 Monday April 1st 1878 I got the washing done before noon and did some sewing. I worked on Hatts polinaise till four oclock when I went to town to invite company for tomorrow night. Hatt did part of the ironing in the afternoon. Mother was to town. My friends all promise to come tomorrow evening. I was at [illegible] a few moments and at Mrs Payers. She and Kate came away down the street with me. It was late supper time when I got home. I helped do up the work and sewed in the evening.